It was not a great race but it was an important one. The McLaren one/two, with Alonso first, makes the driver's championship close to a two-horse race. Raikkonen and Massa are still in with mathematical chances but, as long as the McLaren drivers keep finishing GPs, they cannot be caught, so narrow is the points difference between first and second these days. Fernando Alonso is the first of the four contenders to break through to four wins this season and he is the only one to have finished in the points at every race - yet he trails Hamilton in the championship. Reason for a slight adjustment in the points system, I think. Going by form to date, the other three drivers will now take their turn to win one of the races, leaving them with four victories each and one race to go. Perhaps the winner of the last race will also be the champion, thereby ensuring that the guy with the most victories also wins out in the end. That is unlikely, of course, but IT would be nice from a symmetrical point of view, a form of icing on the cake of a very hard fought season. As for the Monza race itself, it was entertaining enough, Lewis Hamilton's surprise move on Raikkonen from way back being a highlight. There is no doubt that Kimi was caught napping and in future drivers will watch Hamilton in their mirrors much more carefully. Kubica too put in a stirling effort, fighting back from a botched pit stop, while Heidfeld did his usual quietly efficient job of bringing the BMW home in as high a position as it was capable of. There were times when it looked as though he might be able to contend for third spot with Raikkonen but they were short-lived indeed - the Ferraris are still too good, even when off form. I seem to remember someone saying that all the tracks were good for Ferrari after Hungary but Monza certainly proved that theory wrong. 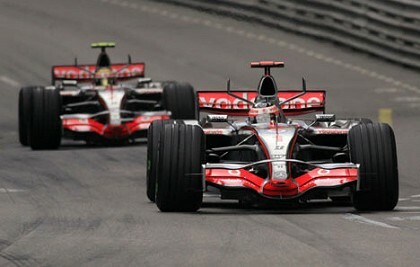 The McLarens had a definite advantage here and Alonso's win looked effortless and inevitable. I would guess that the pendulum will continue to swing between the two teams for the remainder of the season and that McLaren will walk away with the constructor's championship at the end. That all depends upon Thursday's meeting of the WMSC, of course, and we can only hope that its decisions do not interfere too much with such an interesting season. Monza was a slight break in the dark clouds hanging over McLaren, the win coinciding with rumors of a possible deal hammered out between the warring teams (swiftly denied by Jean Todt, but perhaps a sign that things are not quite as clear-cut as may have appeared recently). Thursday's child has far to go, runs the nursery rhyme - let's hope that the wheels don't fall off F1 this coming Thursday. I never got to the third paragraph and this line stopped me cold: " Reason for a slight adjustment in the points system, I think." Absolutely NOT! The points system has been diddled with too much and too many times, no matter what you do some ocassion will arise two years from now and we'll be typing these same words again. Sato and Davidson, each has nearly identical finishing averages, Sato 13.5, Davidson 13.9 but Sato has earned ALL the points. The reason he's IN-consistent. Good on some days, good enough to earn points, bad on other days, bad enough to drag his average down, but Sato's inconsistency has paid in points, my issue is the points system WORKS for both consistent or in-consistent drivers. Another change ISN'T an improvement. That's why I said "slight", Number 38 - I do feel that the most recent adjustment to the points system made things worse and it needs to be rescinded. Just to make the gap between first and second three points rather than two, that's all that's required. Not that it's essential. I think the drivers know the points system whatever it is and they know what they have to do to score. Each year tends to produce the right champion, no matter how you score it. In a sense it did happen in F1 once.......the great schoomi's Ferrari engine failed handing Alonso the championship, not quite the last lap drama but ...... we CAN'T ensure everything finishes the way it should. REAL champions don't always win, but we should be able to tell the REAL champions from the winners. Just say Stirling Moss and it's clear that the real champion doesn't always win. But over the year's performances, it's the one who manages to string the best results together who wins. Luck tends to even out, unless your name happens to be Chris Amon. For instance, you mention Schumacher's engine failure last year that effectively handed the championship to Alonso. But you're ignoring Alonso's engine failure in Italy that equally gave Michael a chance of catching him in the title race. Franchitti may have apparently won at the last through Dixon running out of fuel but the reality is that his entire season put him in the position where such a twist of fate could make the difference. Any points system is a matter of interfering with the outcome to the championship - that's its job, actually. I am not proposing that the system be changed except in one small matter to increase the value of a win. I am not in favor of the exaggerated systems proposed by some that give far too much value to a win, but I admit that there should be more of a difference between first and second, that's all. Clive, your a friend, you've mastered the language, you've got a way with words, you could out talk a lawyer and a politican simultaneously, but concerning the points........you're going down the wrong path. More points for a "win"........bah humbug! That's been talked to death. It's a loser. I might, and it's going to cost you, I might give in to ADDITIONAL points for pole or fastest lap. This might apease you as the pole winner is almost always the race winner, and I could live with it as one must EARN the pole it's not just a free point. Points and blue flags ....... I'm the authority. Under points systems, it's possible for a driver that has won no races during a season to be crowned champion. In my dictionary, the first definition entry for the word `champion' is simply one word: "winner". Therefore, whoever wins the most races in a season should be the champion. In the event of a tie, the driver that has the most second place finishes would be the champ, etc. Points are crap. A lot of people would agree with you, including Bernie Ecclestone, William. I just feel (not very strongly) that the present system usually turns out the rightful champion - a slight adjustment to increase the value of a win is all that's needed. The problem with the winner takes all system is that it leaves no incentive to the drivers in lesser cars. In a season where there is one car that is better than all the others, a driver could be champion midway through the year.